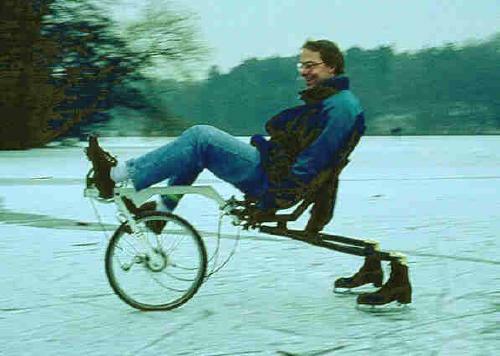 FlevoTrike that is adapted to riding on ice. The improvised attachment of the skates made them flip too easily. But there have been skating Flevo's which could ride over the ice very well. The front tyre is equipped with nails. 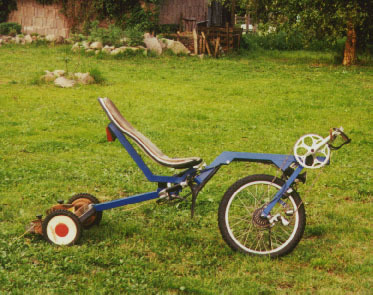 This Flevotrike can be used as lawnmower. Ariella Bijl designed this special Flevo-camper as end-of-study masterpiece. A flexible tube attached to the frame works as a tent pole, suspending the whole tent. 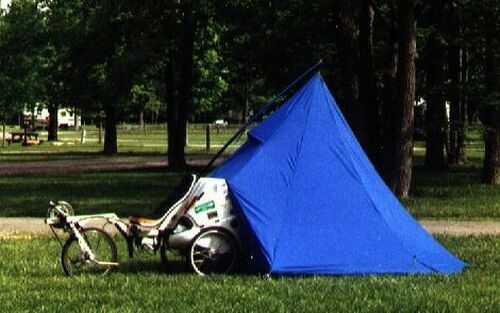 The whole tent could be stored in the luggage box of the trike. With two of these trikes, she and her partner Bart traveled in 2 months time in 2000 from Los Angeles to New York: 5117,2 km.